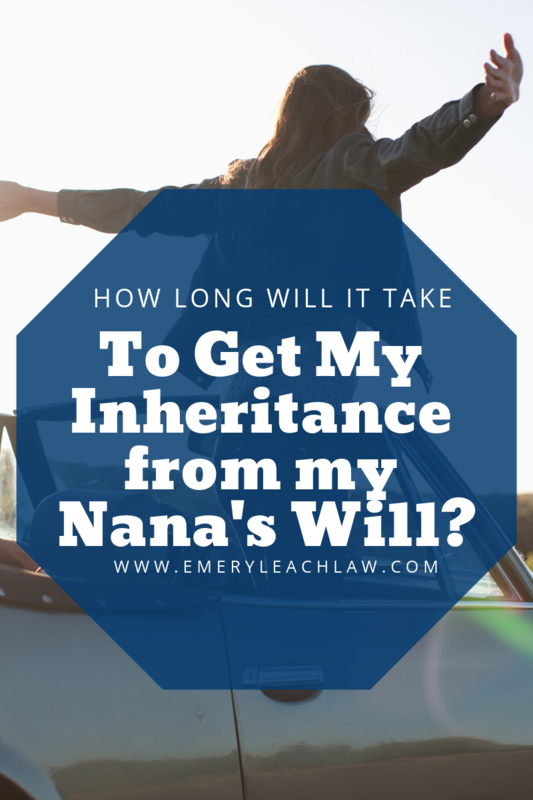 How Long Will It Take to Get Your Inheritance? You are here: Emery Leach > Articles > Estate Administration > How Long Will It Take to Get Your Inheritance? You hang up the phone, you’re sad to hear your Grandmother passed away, but you’re also a little bit excited by the idea that you might get some money from her will. She lived a good, long life, it wasn’t unexpected. Sure, you’ll miss her amazing chocolate chip cookies, but maybe you can finally buy that silver, 6-speed manual convertible that you’ve been eyeing up. You picture yourself zipping down the expressway to the shore, already having spent money that you haven’t received. Before you hop in your old car to trade it in for an upgrade, it’s time to pump the brakes. (Is that enough car puns?) You may not see money from your grandmother’s estateThe property that one leaves after death; the collective assets and liabilities of a dead person. Black's Law Dictionary (9th ed. 2009) for at least nine months, more often it’ll be at least a year and a half. That probably seems like a long time, especially when a silver, manual convertible is calling your name down on the auto lot. It might surprise you to learn that other people have a right to your Grandmother’s life earnings before you do – like her husband, your mom or dad, or your aunts and uncles. So, let’s take this one step at a time so you can understand just how long – and why it takes that long – before you receive an inheritance. EstateThe property that one leaves after death; the collective assets and liabilities of a dead person. Black's Law Dictionary (9th ed. 2009) is a fancy word, but here is simply means everything that a person buys, owns, or otherwise accumulates during their life. It includes everything from clothes, cars, and jewelry, to house, land, boats, and bank accounts. When we say everything, we mean all the things. Grab yourself a big bowl of ice cream and cry because you lost your mom. This might seem exaggerated, but I’m probably missing a few side-adventures that a person will take. In New Jersey, a person who wants to be the executorA person named by a testator to carry out the provisions in the testator's will. Black's Law Dictionary (9th ed. 2009) of an estate has to wait at least ten days before they can even go to the Surrogate’s Court for the Letters. More often, they wait several months because they just don’t know what they’re supposed to do, or because they can’t find a Will that they just know their parent made. Now that someone is has been named and is acting as the ExecutorA person named by a testator to carry out the provisions in the testator's will. Black's Law Dictionary (9th ed. 2009), it gets even more technical. Being named and taking the oath of the ExecutorA person named by a testator to carry out the provisions in the testator's will. Black's Law Dictionary (9th ed. 2009) is the easy part. It only gets harder from here. Find all the bank accounts. Find all the life insurance policies. Find all the retirement accounts. Notify the Social Security Administration. Deal with claw backs on pensions or social security payments. Deal with creditors of the decedentA dead person, esp. one who has died recently. This term is little used outside of the law. It typically appears in legal proceedings or administrative inquiries. Black's Law Dictionary (9th ed. 2009), including credit card companies, student loans, car loans, mortgages or reverse mortgages, etc. List a property for sale. Wait for it to sell. Determine if they’ll take a lower amount on the property so they don’t have to clean out the house. Clean out the house anyway. Appraise jewelry, art, or other collectibles. Find that brooch that Aunt Josephine is looking for and swears is hers. Pay out any debts that need to be paid off. Aggregate the balance of everything. Review the Will again or do some more internet searches to determine who gets what if there is no Will. Tally up the balance after paying debtors and any specific gifts. Buy an off the shelf tax software and try to figure out what needs to be done for the estateThe property that one leaves after death; the collective assets and liabilities of a dead person. Black's Law Dictionary (9th ed. 2009) and inheritance tax. Do some more internet searches. Decide if they’re going to take the Executor’s Compensation percentage. Send checks to the heirs for what the Will said they’re supposed to get. Get another bowl of ice cream. Add another scoop of ice cream to the bowl and put phone in moon mode. So, there you have it, the 50 steps most people go through to handle an estateThe property that one leaves after death; the collective assets and liabilities of a dead person. Black's Law Dictionary (9th ed. 2009), and why you’ll need to wait at least nine months before you can be driving your silver, manual convertible to the shore. If you know someone who needs help with an estateThe property that one leaves after death; the collective assets and liabilities of a dead person. Black's Law Dictionary (9th ed. 2009), come join our new EstateThe property that one leaves after death; the collective assets and liabilities of a dead person. Black's Law Dictionary (9th ed. 2009) Administration Course. We know it’s not a catchy title, we’re working on it. This self-guided course will help you (or your friend) to be the best executorA person named by a testator to carry out the provisions in the testator's will. Black's Law Dictionary (9th ed. 2009) they can be with our guidance. Apply for the Executor Masterclass! We're hard at work on an ExecutorA person named by a testator to carry out the provisions in the testator's will. Black's Law Dictionary (9th ed. 2009) Masterclass that will help you to navigate the New Jersey probateThe judicial procedure by which a testamentary document is established to be a valid will; the proving of a will to the satisfaction of the court. Unless set aside, the probate of a will is conclusive upon the parties to the proceedings (and others who had notice of them) on all questions of testamentary capacity, the absence of fraud or undue influence, and due execution of the will. But probate does not preclude inquiry into the validity of the will's provisions or on their property construction or legal effect. Black's Law Dictionary (9th ed. 2009) application process. Our first session will be starting sometime in February 2019. Apply to join the first class below! Who Pays My Debts When I Die? What do you hope to learn in this masterclass? What level of investment are you willing to make? Are you working with a decedentA dead person, esp. one who has died recently. This term is little used outside of the law. It typically appears in legal proceedings or administrative inquiries. Black's Law Dictionary (9th ed. 2009) who was a New Jersey resident?